Thirteen years and 92 Allianz League games later, Meath's Division 1 exile is poised to end. The Royals will achieve it on home territory in Páirc Tailteann on Sunday if they beat or draw with Fermanagh, who are currently second in the Division 2 table just two points behind them. If Fermanagh win and Donegal beat Kildare, the two promotion places will be decided on scoring difference. Fortunately for Meath, they are well-placed there too, 15 points ahead of Donegal and 18 ahead of Fermanagh. It is a happy situation for Andy McEntee's squad, one that contrasts sharply with last year when they had to win their last two games to avoid dropping to Division 3. McEntee was relieved, but he echoed a sense of frustration which resonated all over the county after completing the survival by beating Louth in the final round. "We had to win the last two games so our backs were to the wall. Credit to the lads how they responded. "However, if you want to be really brutal about it, we are in the same position this year that we were this time last year - still in Division 2," he said. Eight weeks later, Meath lost to Longford for the first time in 36 years in the Leinster championship, a shattering setback which raised questions about where the McEntee regime was headed, if indeed it would even last. The turnaround came in the All-Ireland qualifiers, even if Meath didn't survive the first round. Tyrone beat them by a point in extra-time in a game which the Royals were unlucky to lose. It was the start of a Tyrone run which took them all the way to the All-Ireland final. As Meath looked on, a sense that they weren't that far off the top contenders hardened into a belief that 2019 could be a year of significant advancement. That has been the case so far. The highest scoring return in Division 2 (average 1-15 per game) has secured five wins from six games (the only loss was against Donegal) and left promotion in their own hands heading into the final round. It has set the scene for a special atmosphere on Sunday, with the Meath public set to turn out in large numbers for what they hope will be a release from mundane Division 2 life. It's 13 years since they last saw a Division 1 game in Páirc Tailteann and while Meath beat Derry, it wasn't enough to save them from relegation. On the same day, a late point from Steven McDonnell saw Armagh win against Wexford and drew them level on the table with Meath, whose inferior scoring difference left them in the drop zone. "Meath have been relegated before and came back up. It's not the end of the world," said then manager Eamonn Barry. He was right about being relegated. Two years earlier under Seán Boylan, Meath dropped out of Division 1, but came back up at the first attempt. It was very different post-2006. Division 2 became Meath's new home and even when they exited for a year, it was in the wrong direction, dropping into Division 3 under Séamus McEnaney in 2012. Nineteen other counties have been in Division 1 since Meath were last there, a stark reminder of how long the recession has lasted in a county which has won the title seven times. They had a few close calls, notably in 2015 when they missed out on promotion to Roscommon on the head-to head rule. In 2017, they were third behind Galway and Kildare. With Meath's return to Division 1 now highly likely, they are also in a position to help Kildare in their bid to win promotion. 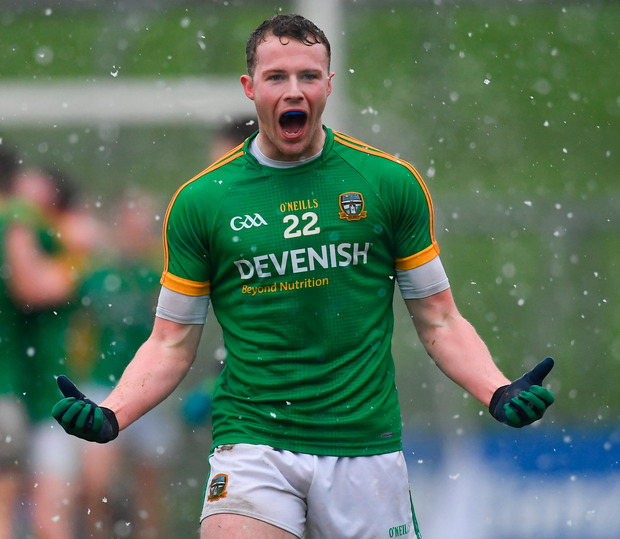 If Meath (10pts) beat Fermanagh (8pts) and Kildare (7pts) beat Donegal (8pts) in Ballyshannon, the Leinster pair will be promoted, giving the province three teams in Division 1. That would be a huge boost to the province that hasn't had three teams in the top flight since 2014 when Dublin, Kildare and Westmeath were all there.